LEDs provide additional conspicuity to a stop sign face. Flashing LEDs around stop sign face (MnDOT). Light emitting diodes (LEDs) are often placed around the face of stop or speed limit signs. The LEDs provide additional conspicuity to the sign face. Use of LED lights around a sign face is covered in Section 2A.07 Retroreflectivity and Illumination of the Manual on Uniform Traffic Control Devices (MUTCD) (FHWA 2009). LEDs can be embedded to outline the sign or its words and symbol. The LEDs may flash or be set to steady mode. LEDs may also be constantly illuminated or activated by pedestrians or vehicles. In some applications, the lights may only be activated if sensors detect approach speeds where a driver is not likely to stop (Winn and Rice 2009). A study conducted for the Minnesota Local Road Research Board (2014) included a cross sectional analysis of locations with flashing LED stop signs (n=15) and locations without flashing LEDs (n= 240). They reported a 42 percent decrease in right-angle crashes after LEDs were installed. In addition, they reported that drivers were significantly more likely to stop fully after installation of the LEDs when opposing traffic was present. A study by the Texas Transportation Institute evaluated the effectiveness of LEDs embedded in stop signs and found a 28.9 percent decrease in the number of vehicles that failed to stop fully and a 52.9 percent decrease in vehicles that did not slow significantly through the intersection (Gates et al. 2004). A study by the Virginia Tech Research Council also evaluated LEDs embedded in stop signs and found a 2.7 miles per hour (mph) decrease in vehicle approach speeds with greater decrease at night than during the day (Arnold and Lantz 2007). Arnold, E. D. and K. E. Lantz. Evaluation of Best Practices in Traffic Operations and Safety: Phase I: Flashing LED Stop Sign and Optical Speed Bars. Report FHWA/VTRC 07-R34. Virginia Tech Research Council, 2007. FHWA. Manual on Uniform Traffic Control Devices for Streets and Highways (MUTCD). U.S. Dept. of Transportation, Federal Highway Administration, Washington, DC, 2009. Gates, Timothy J. and H. Gene Hawkins. Applications for Advanced Sign Sheeting Materials. Report 0-4271-S. Texas Transportation Institute (TTI), 2004. Minnesota Local Road Research Board. 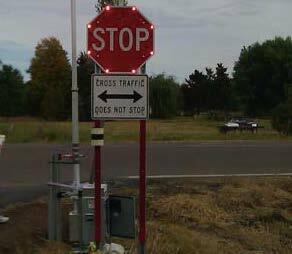 Impact of Flashing LED Stop Signs on Crash Reduction and Driver Behavior. Minnesota Department of Transportation, St. Paul, MN. 2014. Winn, Michael and Ed Rice. Embedded LEDs in Signs. Report FHWA-SA-09-006. Federal Highway Administration, 2009.